In the Spring of 1948, wives of local Jaycees members decided to participate in projects sponsored by their husbands’ club. Eight women began volunteering in various Jaycees community programs. The popularity of the group quickly spread. In a year’s time the women had recruited 60 other members. The Club membership was then limited to 100. In 1951 the membership limit was raised to 125. At the time, the annual dues was five dollars. Our Club women wear many hats: friend, mother, professional, and advocate. They bring these qualities to all of The Woman’s Club’s activities. In March 1949, the Young Woman’s Club of Williamsburg received its official charter from the General Federation of Women’s Club of Virginia and the General Federation of Women’s Clubs. Seventy-five members carried on the mission of implementing programs designed to augment various charities. The Club’s public services included making holiday favors for the trays at Eastern State Hospital, donating time to the “Servicemen’s Center,” collecting comic books, magazines, and playing cards for use at the Fort Eustis Hospital, collecting and distributing books for local hospitals, working with the Youth Center, and transporting children to Richmond for medical treatment. Growth eventually forced the group to split along age boundaries. In 1954 the Junior Woman’s Club, with 22 charter members, began catering to women to the age of 35, and those over 35 joined The Woman’s Club of Williamsburg. The division had no adverse effect on either group. Today, over 60 years later, The Woman’s Club of Williamsburg has 86 members who are involved in many worthy projects and continue to support established programs. In 1956, the Bicycle Licensing Ordinance and Safety Program for children and adults, proposed by the Club, was endorsed and supported by civic and social organizations, the police department and approved by the Williamsburg City Council. For its achievement in traffic accident prevention, the National Safety Council of Chicago awarded the 1957 Carol Lane Award, The Certificate of Merit, to The Woman’s Club of Williamsburg. In 1959, each club member donated one dollar toward the GFWC Virginia’s request that the clubs provide $25,000 to the Medical College of Virginia as “seed money” to purchase a cancer treatment machine called “Maxitron.” The Federation exceeded its goal. Presently The Woman’s Club of Williamsburg donates more the $10,000 each year to scholarships and charitable organizations. The money is raised through the Club’s annual dues and fundraisers. In September 1960, The Woman’s Club of Williamsburg established a college scholarship plan. Initially the plan offered an annual award of $100 to a qualified high school senior at James Blair High School, Walsingham Academy, York High School and Bruton Heights High School, who were residents of Williamsburg, James City County, or Bruton District of York County. The schools recommended students for the award, and the recipient was chosen for scholastic record, good character, and need. The scholarship could be applied to a student’s tuition, books, room and board, or laboratory fees. The first scholarship award of $100 was given to Miss Margaret Minier of York High School to be used at Duke University for the academic year 1960-1962. The amount given and the number of scholarships awarded have increase through the years. In 2011, four scholarships valued at $1000 were awarded. Many fundraising projects have been undertaken to support this endeavor. However, most of the support for the scholarship program has come from our annual Fashion Show, first held in 1996. In 1961, Ways and Means projects included a grocery booth at the Lion’s Club Jamboree, bake sales, selling balloons on the street at the William and Mary homecoming parade, rummage sales, and a talent table at club meetings, Our Ways and Means projects have come a long way, to say the least. In 1962, the Club developed a yearly Community Calendar to provide college scholarships to local graduating high school seniors to assist with their first year’s college expenses. Through the 1960s to the present, club members have crafted puppets and happy faces which are given to the children’s wards at local hospitals. In 1964-1976, through our public service, the club helped man the Virginia Museum of Art’s mobile unit in Williamsburg, donated to Eastern State and Patrick Henry hospitals, assisted with the open house of Tidewater Mental Health Clinic, furnished a model for the Junior Woman’s Club Fashion Show, distributed posters for the Heart Fund and Tuberculosis X-Ray drives, contributed a book to the Williamsburg Regional Library in honor of National Education Week, donated to the Wednesday Morning Music Club to help sponsor a concert by the Peninsula Symphony Orchestra, and donated to the SPCA. In 1969, the Club honored the General Federal of Women’s Clubs (GFWC) request by contributing toward the purchase of “Clinic 6,” a cancer treating machine for use at the Medical Center of Virginia. With the increased growth in the area’s population, the Club saw the need for a community center to provide a place for youth activities and a meeting place for 22 community organization. The Club’s Community Calendars for 1965 and 1966 raised $2700 to retire the loans for the community center and the mortgage was burned. In 1972, the Club supported the Equal Rights Amendments for Women. In 1977, the Club assisted with the Channel 15 Great TV Auction, and donated $1500 to the fire department for the purchase of two frequency-transceivers. In 1978, the Club influenced the Virginia Department of Transportation to widen Longhill Road leading to Lafayette High School and was awarded a Silver Tray Safety Award by the Tidewater District. In 1985-1986, members’ initiatives united the efforts of the College of William and Mary, the City of Williamsburg, the Colonial Williamsburg Foundation, and city residents in resolving the parking problem around the college and side streets. In 1988 and continuing, members have supported FISH with annual food drives and our members volunteer many hours to FISH. Our members have worked at Busch Gardens, earning thousands of dollars for the Club over the years, to support numerous Club projects. In 1989, the Club contributed to the Arthritis Telethon. In 1991 the club participated in World Food Day, contributing money to CARE. Members continue to collect Farm Fresh receipts and Campbell labels for the schools to use in acquiring needed equipment. 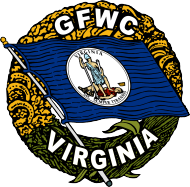 In 1994, members attended the GFWC of Virginia Legislative Rally Day at the General Assembly in Richmond. Centerpieces were provided for the GFWC “Tree of Knowledge” conference. Members joined with other organization to prepare lunches for volunteers working on construction of the Kidsburg playground. Since 1999, the Club, along with the League of Women Voters and the Williamsburg Library, has co-sponsored the Great Decisions meetings held at the Williamsburg Regional Library. Our Woman’s Club has been honored as a Five Star Club in the Federation.